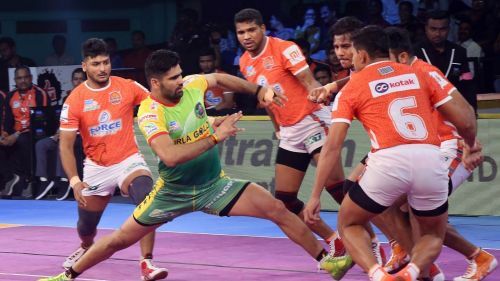 This was something that all of us expected from the 'Dubki King' Pardeep Narwal. The 21-year-old surpassed Rahul Chaudhari to become the best raider in the history of PKL. Pardeep had been the find of season 3. Since then, he has been regularly troubling the opposition defenders. His trademark has been his hand touches and dubki. Pardeep took almost 15 matches less to surpass Rahul. Right now, Pardeep stands on 858 raid points, whereas Rahul stands on 825. The value of the same increases as Pardeep has played 2 seasons less than him. He has been phenomenal not only in the raiding but in leadership as well. Under his able guidance, Patna Pirates have won 2 consecutive seasons (season 4 and 5). He is probably the finest player Indian Kabaddi has ever produced. Let us hope that he continues his dominance in the sport.